On Sunday, November 29th, The Discovery Channel showed the final episodes of the third season of Storm Chasers. In those episodes, the chasers got very close to, or even inside tornadoes. I can’t state too emphatically what a terrible idea this is. The people in those espisodes were experienced meteorologists in armor-plated vehicles specially shaped to aerodynamically resist wind. An ordinary vehicle would be overturned or carried away. 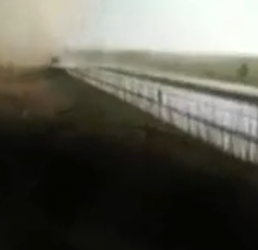 This photo, a screen capture from KSNW-TV news film, shows a minivan pulled off the Kansas Turnpike, thrown into a field, and thrown back across the Turnpike by a F-2 tornado on April 26, 1991. The people inside were seriously injured. It is not always obvious a tornado is forming or approaching your immediate area. 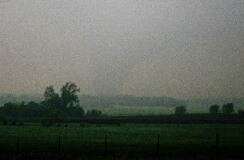 Here is a photo I took of an approaching tornado in 2003 near Lyndon, Kansas. The tornado was close enough that I could hear it. Could you recognize the tornado, through the haze and heavy rain, in time to get out of its way? I’m not convinced the chasers in the armor-plated vehicles would have survived an F4 or F5 tornado. If you want to chase, there are companies like Tempest Tours and Silver Lining Tours that will, for a fee, take you storm chasing and will keep you as safe as possible. Please do not endanger yourself and clog highways trying to chase storms.